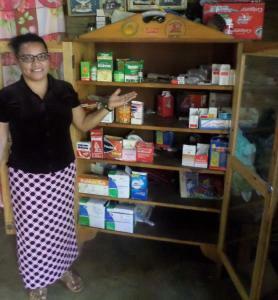 to buy medicines, fruits, sugar, and plastic bags to bag her products. Evangelina benötigt für dieses Geschäft noch 500 US-Dollar. » Schon mit 25 US-Dollar können Sie Evangelina unterstützen! Geld wird für Evangelina gesammelt. Evangelina is 38 years old. She's the mother of four children and a very responsible wife who has been married 18 years. She lives along the white beaches of the village of Amapala in the department of Valle in the south of Honduras. She's been working preparing and selling fresh cold drinks for several years. She also prepares charamuscas (frozen juice in a bag) as these are popular and refreshing drinks appropriate for the hot climate in this southern area. She also sells artificial juices of various flavors and purified water as these products are easy to sell in this region. She also sells a great variety of medicines. She is requesting this loan mainly to buy medicine as well as a variety of fruits, sugar and plastic bags to bag her products. Her dream is to grow her business. San Lorenzo, Valle; Honduras, March 2019.